If you haven't seen Artboard, then you should take a look at this. Artboard is a full-featured graphics design app for creating vector drawings and illustrations. Design logos, posters, floor plans, technical drawings, fun fashions, web graphics, and more. Unlike pixel-based images, vector graphics are composed of editable objects that are infinitely scalable. Indianapolis, Indiana - Mapdiva is dedicated to making intuitive software so users can focus their creative energy on content and design. 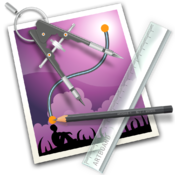 Founded in 2008 by Graham Cox and Jill Saligoe-Simmel, Mapdiva, LLC develops powerfully easy vector illustration software. Mapdiva, LLC has offices in Indianapolis, IN USA and Armidale, NSW Australia. Copyright (C) 2008-2014 Mapdiva, LLC. All Rights Reserved. Apple, the Apple logo and Macintosh are registered trademarks of Apple Inc. in the U.S. and/or other countries.